Find out about Nudge Marketing, what it is and how it works. Every year, in the UK, we complete our taxes. Included in this morass of virtual paperwork (and I have to say, hats off to the government for the fullest of digital transformations across departments) is the annual car tax. 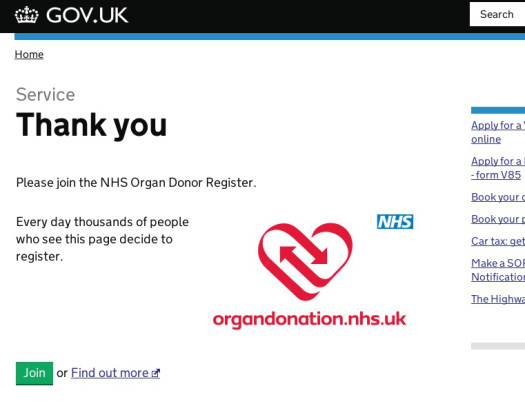 I recently completed my car tax and on completion received a request to register for Organ Donation. Which I duly did; as had my wife moments earlier. I was online and I had been nudged. Now as a successful demonstration of the UK government’s Behavioural Insights Team’s activities, I think this is really commendable – but it did make me wonder about my decision and, indeed, how to create an environment where digital marketing delivers the final, well, nudge. Did I respond out of philanthropy? Or was it purely guilt? Had I been marketed to, and if so when? And again, whom, or what played the greatest influence? Like all digital marketing and nudges, the detail is often in the story (of the touch point). I had recently seen the Grateful Dead‘s Farewell Tour and in it Phil Lesh made an observation about Cody, his liver donor. At the time, this didn’t nudge me…but it did make me think about it. So, in a sense, I had already been warmed up for the later call to action through the multichannel experience of a rock concert. An experience which usually leaves all audiences in a positive frame of mind, regardless of their musical tastes. And that final click? What made me do it? In truth, probably the fact that my wife did it a few minutes before me. And this shouldn’t surprise anyone, given what we know about positive influencers ( I feel a blog post a-coming). And it then made me think of the classic nudge considerations as defined by Thaler and Sunstein and how this might be applied to the industry I work in – the pharmaceutical industry. Is it possible to benevolently nudge Health Professionals to prescribe drugs? Indeed, is that even ethical? Is it possible to nudge patients to be more adherent to their regime. And if so, what is the framework? How do you nudge someone? How do you effectively change behavior. Although nudge seems to be slightly weighed down by academia as much as practical marketing examples, fortunately there are some clear principles of nudge marketing to guide us. And they are quite straight forward. Be specific about the behavior that you are trying to influence. Respects people’s right to choose. Think user first. Which choice is best according to them? Keep it simple. Don’t have too many alternatives. Reduce the complexity. Make it easy to choose. Use social norms to help make the nudge stick. Set the default for the best decision. Decisions influence outcomes. Design for this. Indeed, the good folk at Robert Wood Johnson Foundation, who have a goal of building a culture of health, produced this handy infographic which touches on my earlier point about influences. Infographic from the Foundation showing ‘incentives for change’. And if that wasn’t enough to suggest this is something we should think about as marketers, digital or not, perhaps give Rory Sutherland‘s 12 minute Ted talk a quick watch. As you’ll have seen from the ‘About Us’ section, I’m interested in changing behaviors for the better and understanding how this works with digital marketing. So why not get in touch and start that conversation? The Behaviour Change Wheel: A guide to Designing Interventions. NOW & ZEN Create a free website or blog at WordPress.com.